This family of durable, reliable balances delivers the performance and precision you'd expect to find only in premium-priced balances. 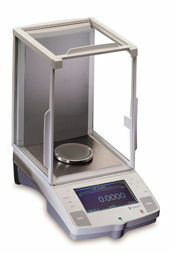 With standard features such as 4-button, simplified menu operation, internal motorized calibration, GLP software, and 11 weighing modes including simplified parts counting, percent weighing and 1 user-definable custom unit, each Analytical Plus balance provides a perfect combination of user-friendly operation and value. The balance that makes your application easier. It's a total application solution. Make complicated procedures easy! 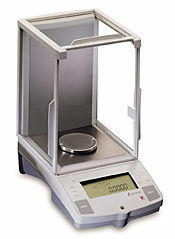 Ohaus Voyager® analytical balances give you access to sophisticated applications simply with the push of the button. Voyager® lets you store these applications in a library then recall them when needed. The large, high-resolution backlit graphic display makes Voyager® easy to use - just follow the menu prompts to make your most complicated procedures simple. With optional internal calibration Voyager Autocal™ automatically calibrates itself when it senses a change in temperature sufficient to affect weighing accuracy. 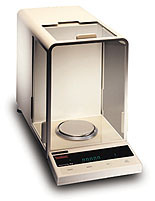 Available in toploading or analytical, as well as high-capacity models, Voyager's applications include parts counting, differential weighing, quick check, statistic formulation, filling, animal weighing, percent formulation, check weighing, density determination, SQC and pipette calibration, with GLP/GMP protocol and FunctionLink™ to run multiple applications simultaneously. The Ohaus Explorer® is perfect for users who demand high performance in a dependable, easy-to-use workhorse balance. Through the Ohaus Modular Concept, Explorer® gives users the freedom of choice to select the capacity and resolution, advanced features and calibration they want in a standard balance. 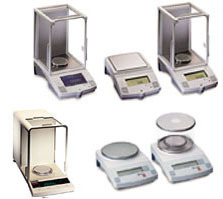 Applications include GLP protocol, parts counting, animal weighing and percent weighing. When needs change, upgrading to more advanced features and applications is as easy as snapping in a new Voyager® display module. 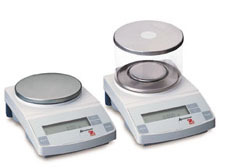 Affordable, accurate and easy to use, the Ohaus Adventurer™ is the latest addition to our toploading balance line for basic weighing functions. Features include RS232, 17 weighing units including parts counting, and integrated weigh-below hook. The Adventure has simple 3-button operation, with a separate print button, a large, easy to read LCD display and integral security bracket. Optional accessories - In-use cover, security device, and printer.